This touchscreen monitor makes it easy to interact with the content being displayed on the screen, and with the included articulating stand you can adjust the angle of the display for maximum working comfort. In addition to the comfortable touchscreen, this monitor also features reduced size bezels for a more unobstructed view. The P2418HT Touchscreen Monitor features a Full HD 1920 x 1080 resolution accompanied by a 1,000:1 contrast ratio, a 250 cd/m² brightness rating, and a 6 ms response time to ensure you receive a crisp, clear picture with reduced ghosting. Setting up this monitor is simple thanks to the HDMI, VGA, and DisplayPort inputs; and with a built-in USB hub users can even plug compatible USB peripherals directly in to the monitor. Once configured, the monitor can be tilted, swiveled, and the height can be adjusted to take maximum advantage of the 178° horizontal and vertical viewing angles offered by this IPS display. The 10-point touch feature delivers a more natural and responsive experience, so you can tap, swipe, slide, and pinch in a snap. Enjoy smoother navigation with two-handed touch control across the anti-glare screen, from edge-to-edge. 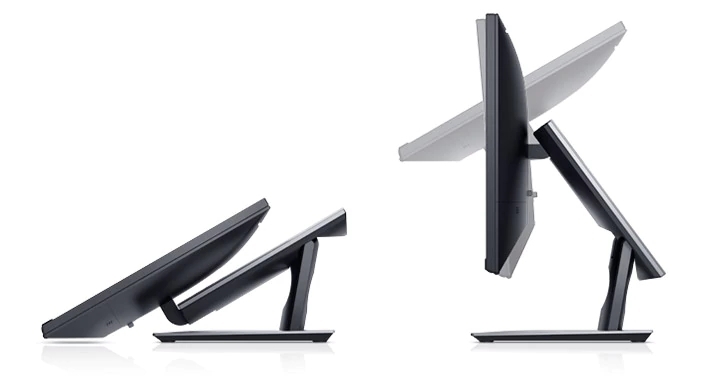 An articulating stand transitions from a standard desktop monitor to a downward 60-degree angle touch orientation. It also supports extended tilt and swivel capabilities, so you can adjust the screen to your task or a more comfortable position. Plus, a protective cushion offers a durable buffer against bumps when the stand is fully compressed. Advanced In-Cell Touch technology eliminates the need for the glass screen found in traditional monitors, delivering an anti-glare surface that reduces distracting reflections and fingerprints. The result is a smooth display with improved clarity that's easy on the eyes. See consistent colors and effectively collaborate across the 178°/178° wide viewing angle enabled by In-Plane Switching technology. Enjoy an anti-glare, flicker-free screen with ComfortView, a feature that filters out harmful blue light emissions. Plus, it's TUV Certified. Collaborate in an organized workspace with an intuitively designed cable management system. Cable routing prevents cables from getting in the way when your monitor stand is adjusted down, while a cable sleeve binds them together. Connectivity ports are discreetly concealed by a cable cover. The Dell Display Manager software lets you multitask and save time. Quickly tile and view applications side by side with the Easy Arrange feature. Customize and pre-set the color settings of your applications with Auto-Mode. Extensive connectivity ports including VGA, DP, HDMI, USB 3.0, and USB 2.0 allow you to easily connect to a wide range of devices. Adapt to different office layouts thanks to VESA-compatibility. Choose to mount your monitor to the wall or attach it to monitor arms and enjoy a more flexible workspace.